You know those wonderful candles that have a timer with the led light? I love just those candles! But…I think, they look so plain. No character. So I got the courage up to plump them up a bit. I took some white taper candles I had from Christmas and gathered up the candles, coffee can, spoon and sauce pan. I covered the counter area by the stove with a couple of brown paper bags. Remember to cover your (fake) candle wick inside candle. I used a piece of the bag, no big deal, it came out easily. See how plain those candles look! They are fine how they are, but I wanted them to look like they are real and have been used a lot! I rinsed out the coffee can, filled a saucepan about 1/3 with water.I broke apart 5 taper candles, and removed the wick. I can use those wicks for another project.I placed the broken up candles in the coffee can. I waited for the water to get hot…then placed the coffee can, with candles inside, in the sauce pot. I waited for the candles to melt. Let the candles in the can melt slowly, don’t rush this. Let the candles melt completely. This was part took a while. I took a brown paper bag, and tore it to open and cover the counter next to the stove. It was a good idea to use the brown paper bag, because all the wax that slid down the candle and puddled on the paper, but it was easily removed and put back into the can. Then you can reheat it! This is how it looked with small drips going down the candle. It looks better…..but I wanted more chunky. This would take forever to keep dripping it with spoon. And if anyone knows me well, they know I like to get my hands into a project….hehee. I had a small tuna can and put it on the paper bag on the counter. Now the coffee can didn’t get too hot to handle, I was prepared to use a oven mitt . So with my right hand, I picked up the coffee can with the melted wax, and with the left hand I lifted the candle keeping it above the tuna can. I thought I would just catch the excess wax in the tuna can instead of just dripping onto the paper bag…and it turned out to be a great idea. I slowly poured the wax on the candle. I noticed the tuna can was filled with wax that was drying up but still warm. I picked up the wax from the tuna can with my fingers and patted it onto the candle….this turned out a easier way. Messy, but easily cleaned off my hands. This is a pic of the finished candles. I really love the look of these. They don’t look fake. 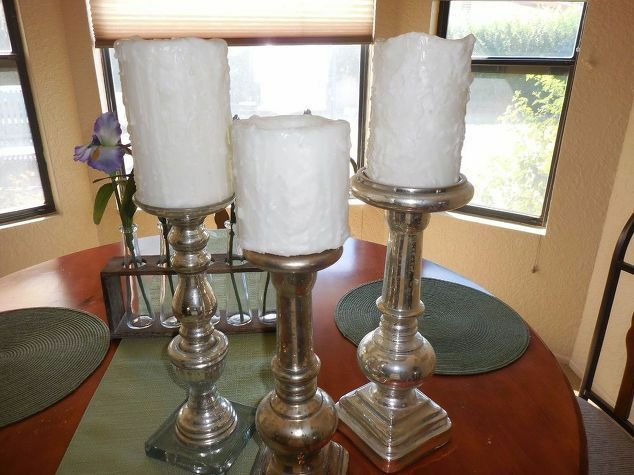 I like the way the candle holders turned out also….they were all done with Rustoleum Mirror Effect. I used gold on the center one, and silver on the others.